(As Featured in Jul.2014 Nourish Magazine) This simple 5 ingredient Spicy Roasted Capsicum and Tomato Soup can be served warm or cold depending on the season. Best enjoyed with toppings. Capsicum is so cheap at the moment. I couldn’t believe it when I saw 1 kilo nets going for less than $2.50. I snapped up a couple to make a batch of this wonderful mid-week dinner soup that I have been craving for a while. You know those cravings you just can’t get out of your head…? I’ve also kept some for pickling (more on that soon). 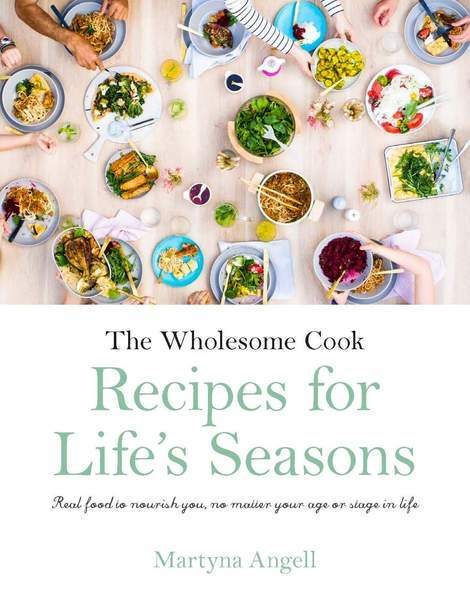 Giveaways: As you already know, the iPad giveaway and free cookbook offer is on and entries are open until 30 August. Details are here if you haven’t entered already. There will be more exciting giveaways and blogger-only competitions too, ooooh, so stay tuned. Recipe posts: I have decided to post recipes twice a week at most, because I don’t want you to see Wholesome Cook as “spammy”. I really want to focus on quality over quantity. I will be drawing a lot more on recipes discovered in my favourite magazines, cookbooks and on other blogs. Why? Because there is so much inspiration to be found out there… Wherever possible and tested, I will include allergy-friendly substitutions. I want you to feel inspired to visit other sites, discover new cookbooks and adapt recipes to your liking too. These will still be delivered to your inbox if you are subscribed. Monthly Newsletter: Starting 4 August, every first Saturday of the month you’ll get a shiny new Wholesome Cook newsletter delivered to your inbox. It will feature exclusive giveaways, product and ingredient spotlights, discount codes and links to other competitions. Yippie! Monthly Foodie Faves posts: Starting 18 August, every third Saturday of the month I will be posting a monthly update on foodie things I’ve discovered, tried, tested, cooked, read, or I am planning to try, test, cook and read. There will also be links to recipes and mini interviews with foodies from all over the web. Exciting times! …Back to the Soup now. I mentioned earlier the soup is made better with a variety of toppings. You can really make it your own, but some of my favourite toppings include grilled cheese baguette a la French Onion Soup, fried chorizo, grilled prawns, seared scallops or calamari, and last but not least goat’s cheese. Pick your favourite and roll with it. The soup is great served warm or cold with a number of different toppings. Pick and choose from cheesy bread, fried chorizo, grilled seafood or Gazpacho-style salad. Or do what I did; mix and match. Wash capsicums thoroughly. Cut capsicums in half lengthways, remove the seeds and cut again lengthways into 3-4 strips. Place capsicum in a large roasting tray. Drizzle with olive oil, toss to coat and roast in preheated oven for 25 minutes. Transfer peeled capsicum strips into a medium saucepan. Add canned tomatoes, stock and Worcestershire sauce. Blend everything with a stick (immersion) blender. Bring to a boil then serve. Distribute soup between bowls. Serve with your choice of cheesy bread, fried chorizo or grilled seafood. Sprinkle with freshly chopped herbs, if you like. If serving the soup cold, allow the soup to come to room temperature then chill in the fridge. Top this version with a finely diced salad of cucumbers, tomatoes, onion and capsicum. Thank you for the book again. It all loooks very exciting and I am definitely going to be one of your most loyal readers. 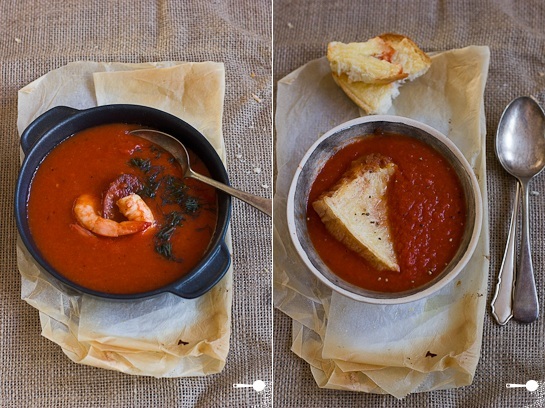 Love the photos, and simple but tasty recipes. Well done! I’m looking forward to the new additions to Wholesome Cook’s posts. The newsletter sounds great and I am sure I will enjoy reading about your new foodie discoveries each month. Fantastic news! 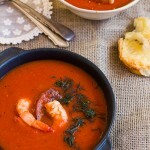 Fantastic and fantastically easy soup with such wonderful taste! Served cold, it would naturally rather resemble the Spanish summer gazpacho! Well, my fingers are frozen as I pen this in the Southern Highlands this early afternoon, so it’ll definitely be the hot version, served with warm crunchy bread! Love your email book – as I have stated before: shall go thru’ it recipe by recipe this weekend to decide which one of them I really cannot live without 🙂 ! Thank you Eha, hope you find a favourite. And yes, it so happens I was thinking of one particular Gazpacho I had in Gran Canaria when I thought of serving this soup cold. Perhaps in a couple of months’ time indeed. What a fabulous soup idea! And for once I almost forget that it’s not summertime in Australia 😉 I already imagine how refreshing it would be on a hot august day like the one we are having today. So many changes on your blog! I find all the ideas excellent and am looking forward to see the first newsletter. It’s so weird, Martyna, but I haven’t been able to load your web page the last several days… and now I have and it looks funny… grrr – I’m hoping it’s my connection or computer or something. Anyways, congrats on all your exciting stuff right now – so awesome! And I love roasted red pepper soup! Thanks Courtney… Looking into all the issues as they surface. Ah the joys of being self-hosted! 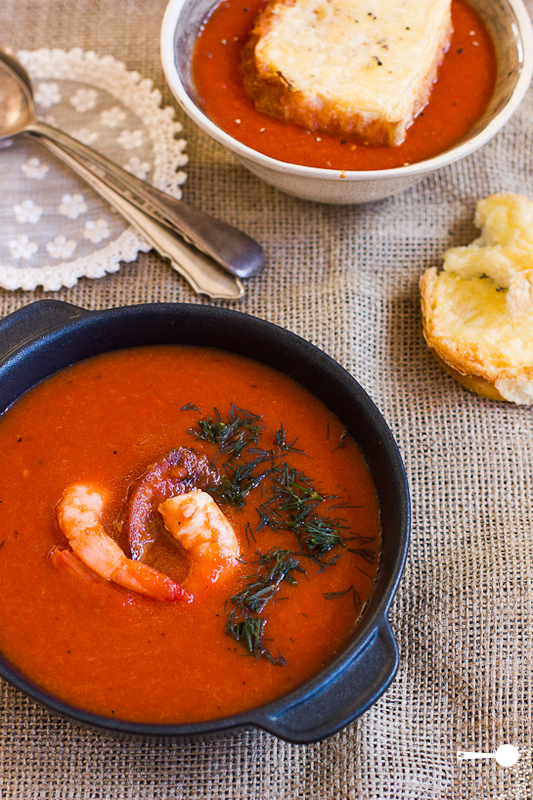 I adore tomato soup, and I love what you’ve done with this version. btw we don’t get Worcestersihre sauce here.. Can I replace it with few drops of tobasco? Hi Ashima, sure thing – Tabasco Sauce would work just as well! Enjoy and thank you for your kind words. I made this today with fried chorizo and it was delicious!